"Sacred bamboo" is vividly described on this kimono. 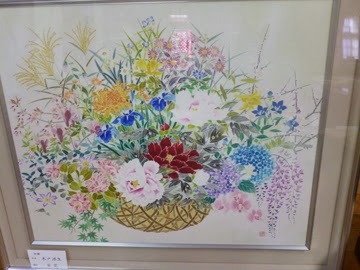 "Realistic depiction" is one of the characteristics of Japanese design. I love this design and base purple color. "Night snow" is the motif of this kimono. the price is less expensive than department store,they said. Sometimes young girl's mother or father visit here to buy kimono for their daughter,for preparation of their daughter's marriage,they said. They are real and vividly described. Lovely kitten and orchid flowers. I think this is peony.It is beautiful. There are many variations of colors and designs here. I found a wonderful picture. Varieties of flowers are described vividely. Japanese artists pursue "realism" fully. That is the essence of Japanese arts. 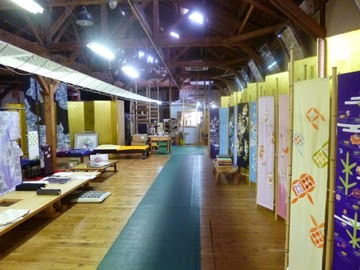 "Shi-kunshi koubou" is the name of the Atelier. Every kimono are elaborately designed,they're impressive. I hope more and more tourists visit here,especially tourists from abroad. Please have a nice weekend,Walter! Thank you　for visiting my blog,jadeXcore! but the wonderfulness of kimono is rediscovered by you! I express my respect for your passion for kimono and your skill of kitsuke. You picked up many beautiful kimonos here, Kumiko! Thanks for showing them to us! I'm happy to let you know about these kimono and artisans.